This parashah covers Exodus 18:1 – 20:23 and tells of Jethro’s organizational counsel to Moses and God’s revelation of the Ten Commandments to the Israelites at Mount Sinai. Yitro, Yisro or Jethro (יִתְרוֹ‬) Hebrew for the name “Jethro,” the second word in the parashah and is the seventeenth weekly Torah portion (פָּרָשָׁה‬, parashah) in the annual cycle of Torah readings and the fifth in the Book of Exodus. 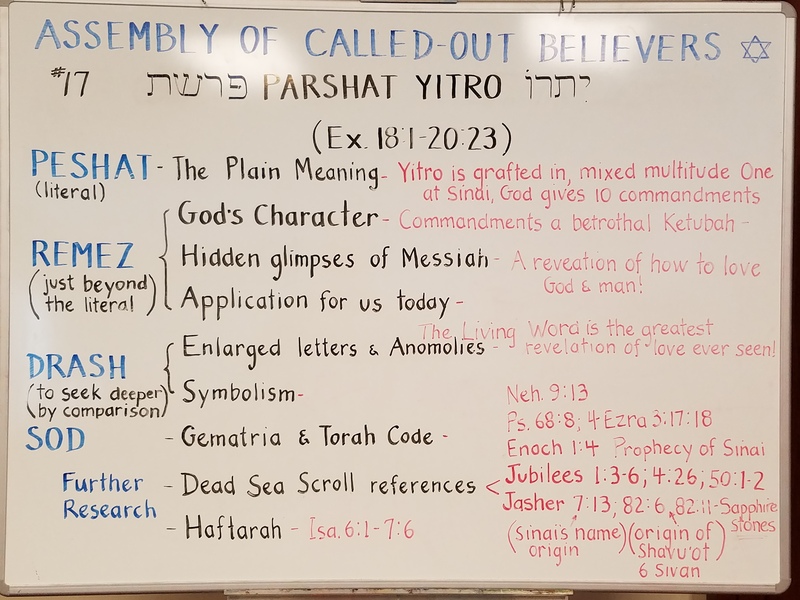 5777 – 17 Yitro whiteboard – In this study we focus on the importance of being grafted into Israel like Yitro and the mixed multitude that came out of Egypt with Isreal and then received the blessing of being apart of God’s betrothal at Sinai and receiving the Ketubah revealing how to love God and our fellow man! Moses’ father-in-law, Yitro, also pronouced Jethro in English, hears of the great miracles which God performed for the people of Israel, and comes from Midian to the Israelite camp, bringing with him Moses’ wife and two sons. Jethro advises Moses to appoint a hierarchy of magistrates and judges to assist him in the task of governing and administering justice to the people. On the sixth day of the third month (Sivan), seven weeks after the Exodus, the entire nation of Israel assembles at the foot of Mount Sinai. G‑d descends on the mountain amidst thunder, lightning, billows of smoke and the blast of the shofar, and summons Moses to ascend. G‑d proclaims the Ten Commandments, commanding the people of Israel to believe in G‑d, not to worship idols or take G‑d’s namein vain, to keep the Shabbat, honor their parents, not to murder, not to commit adultery, not to steal, and not to bear false witness or covet another’s property. The people cry out to Moses that the revelation is too intense for them to bear, begging him to receive the Torah from G‑d and convey it to them. This week’s haftorah discusses Isaiah’s vision of the Heavenly Chariot (the merkavah), a revelation that was experienced by all the Israelites when God spoke the Ten Commandments on Mount Sinai—an event recounted in this week’s Torah reading. Isaiah perceives God sitting on a throne surrounded by angels. Isaiah vividly describes the angels and their behavior (in anthropomorphic terms). During the course of this vision, Isaiah volunteers to be G‑d’s emissary to transmit His message to the Israelites. He is immediately given a depressing prophecy regarding the exile the nation will suffer as punishment for their many sins—and the Land of Israel will be left empty and desolate, though there will be left a “trunk” of the Jewish people that eventually will regrow.